Looks like you are not logged in, or you are not a registered user of Information & Communication Technology (ICT's) Discussion Forum..
You can just read the post, if you wish to get full access to the ICT Discussion Forum, Please Login , if you're not a registered User of this forum, i would like to request you to please Register your Nickname. 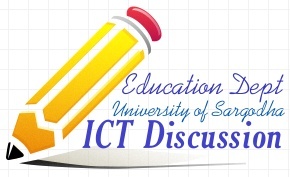 Information and Communication Technology's Forum for the Students of Education Department, University of Sargodha. "We are living in a new economy-powered by technology, fueled by information, and driven by knowledge. The influence of technology will go beyond new equipment and faster communications, as work and skills will be redefined and reorganized." Information Literacy: The ability to search for and hence access appropriate information across a range of genre, formats and systems. The ability to sift, scan and sort information. Technological Literacy: The innate ability to discover how a new or evolved technology operates; recognising its limitations and benefits. The ability to choose the most appropriate tool to access and process information and present new knowledge & understanding. Scientific Literacy: The ability to apply the scientific process and have an awreness of scientific terminology and their applications. Media Literacy: The ability to synthesise a wide range of viewpoints/interpretations from a variety of media and build a concise model of understanding of those ideas. Cultural Literacy & Global Awareness: The ability to manage information in the “global village”. Critical Literacy: The ability to identify key aspects of information validity such as accuracy, objectivity, authority, currency and coverage. Cognitive Literacy: The capacity to build cognitive models/frameworks of understanding. Literacy has traditionally been described as the ability to read and write. ... ability to use computers and other digital technologies Since...New literacies generally refers to new forms of literacy made possible by digital ... spaces where fans of all ages, but especially adolescents ..Digital literacy is the ability to locate, organize, understand, evaluate, and ... Seek Information in the Digital Age....Literacy and Education: Educational ... telecom, datacom and digital exchanges, excellent infrastructure availability and backup support. ..
process information and present new knowledge & understanding. khuram wrote: Literacy has traditionally been described as the ability to read and write. ... ability to use computers and other digital technologies Since...New literacies generally refers to new forms of literacy made possible by digital ... spaces where fans of all ages, but especially adolescents ..Digital literacy is the ability to locate, organize, understand, evaluate, and ... Seek Information in the Digital Age....Literacy and Education: Educational ... telecom, datacom and digital exchanges, excellent infrastructure availability and backup support. .. In viewing literacy within the context of a digitally-infused society as, at one level functional, at another socially engaged, and at a third as transformative, we can see it as a powerful tool for the individual and the group to understand their own relationship to the digital, that is, to be aware of the role of the digital in their own development, and to control it, that is, to place the digital at the disposal of their own goals and visions. Gilster identifies critical thinking rather than technical competence as the core element of digital literacy, and emphasises the critical evaluation of what is found on the Web, rather than the technical skills required to access it. He also emphasises, in the last sentence, the relevant usage of skills “in your life”, that digital literacy is more than skills or competences. Traditionally literacy has been commonly defined as the ability to read and write at an adequate level of proficiency that is necessary for communication. More recently however, literacy has taken on several meanings. Technological literacy, mathematical literacy, and visual literacy are just a few examples. While it may be difficult to gauge the degree to which literacy has an impact on an individual’s overall happiness, one can easily infer that an increase in literacy will lead to the improvement of an individual’s life and the development of societies. hmmm, well, i think this one is the best post to describe the literacy.. The digital age is started in second milenium,and it means that every company,shop,or bar,have at least one computer.When we say,this is age of...,first we think,tehnology of that age.Digital age is started,(digital photos,digital computers,digital books,digital airplanes...).The schools have digital structures,(on knowledge i mean),and we do not writing just on paper,we can write on computer,phones,PDA,or somthing like that.A new generations of cars have auto-control,when jou are sleepy. asma mahmood wrote: The digital age is started in second milenium,and it means that every company,shop,or bar,have at least one computer.When we say,this is age of...,first we think,tehnology of that age.Digital age is started,(digital photos,digital computers,digital books,digital airplanes...).The schools have digital structures,(on knowledge i mean),and we do not writing just on paper,we can write on computer,phones,PDA,or somthing like that.A new generations of cars have auto-control,when jou are sleepy. so According to you, digital age actually started with the idea that every shop,company or bar should have at least one computer? then what ? now i think every company, shop and bar is having a computer, (ignore rare chances), is this what digital age is ? "We are living in a new economy-powered by technology, fueled by information, and driven by knowledge. The influence of technology will go beyond new equipment and faster communications, as work and skills will be redefined and reorganized. Texts and Literacy in the Digital Age is a two-day conference jointly organised by the Leiden University (Book and Digital Media Studies), LIBER, Tiele-Stichting and the Koninklijke Bibliotheek (National Library of the Netherlands) to be held on 16 and 17 December at the Koninklijke Bibliotheek in The Hague, Netherlands. The conference will bring prominent and inspiring speakers together in order to address the changes in scholarly communication within the humanities and social sciences, and more importantly, what these changes mean to authors, intermediaries and users. Media has become a staple in contemporary life. The Internet, video games, and television are all common instruments to people young and old. But what happens when the young sacrifice some of their learning for these modern conveniences? In Literacy in the Digital Age: Reading, Writing, Viewing, and Computing, Withrow discusses the impact of technology on education, and more specifically on a child's developing literacy. Children are not only responsible for cultivating literacy through reading and writing, they also need to be conversant through computers, television, and other digital media. Media literacy has come of age. In a society as mass mediated and media saturated as our own, communication technologies are at the core of the political, economic and cultural environments. society to achieve one’s goals and to develop one’s knowledge and potential in this Digital Age. decision making, participation in civic and cultural affairs, and economic productivity. public policies; collect and organize economic evidence; and weigh costs against benefits. and how it can be used efficiently and effectively to achieve specific goals. and 21st century media in ways that advance thinking, decision making, communication, and learning. What constitutes basic literacy in the Digital Age? (National Center for Education Statistics, 2003). through a range of media. themselves as proficient users of these systems. technology in both social and personal contexts. and synthesize information from a variety of sources. Uchida, Cetron, & McKenzie, 1996). Recently, there has been a remarkable increase in the level of Information and Communications Technology (ICT) re-sourcings. ICT has its importance in supporting the agenda to improve standards across the school curriculum. Developments in information and communication technologies are starting to make it possible to use the tools for assisting the process of learning beyond the boundaries of the classroom. In addition, their use will start to prepare learners for participation in a networked, information society where knowledge is the most critical resource for personal, social and economical development. Information and communications technology have a massive contribution to make to all aspects of this reform agenda. For example, it can make a significant contribution to teaching and learning across all subjects and ages, inside and outside the curriculum. It can provide opportunities to engage and motivate children and young people and meet their individual learning needs. It can help link school and home by providing access to teaching and learning materials, and to assessment and attendance data, from home. ICT can enable schools to share information and good practice in networked learning communities’ intelligent information management systems within schools can support school leadership. The technological changes which we are experiencing are extraordinary. Much of what is commonly used in schools today didn''t even exist 10 years ago and of course in next 10 years many new advanced technologies are coming in education. There are two major initiatives in the public school system at present involving literacy and technology. The goal of the technology initiative is to ensure that all students and staff have ready access to information technology. The literacy initiative is designed to refocus instructional practices to ensure that all students attain a high level of literacy as they progress throughout the education system. Local, provincial, and federal agencies have increased technology funding; departments of education have developed ambitious statewide plans; more schools enjoy access to hardware, software, and the Internet; and educators are developing more ways to apply technology to improve student learning. Therefore, ICT needs to be seen as a key, integral element of the school reform agenda, freeing up time and energy to help remodel the school team, enabling efficient knowledge management within schools, supporting knowledge transfer between schools and outreach to parents and the community, as well as being a largely powerful medium for transforming teaching and learning. Afsheen Sharif wrote: How will digital technologies change our culture in the years to come? In what ways will they shape how we read and learn, what we read and learn, even if we read and learn? The constant changing of culture is undeniably promoted by the advancement of technology and the social judgment of that. Several decades ago the appearance of colored televisions and later the video tape recorders constituted a huge sensation. The situation is the same with the mass usage of computers. The spread of broadband internet caused a cultural revolution. Due to the technological revolution almost all segments of the life have undergone a major transformation in the past few decades. Digital technologies made possible time, space and energy saving activities through replacing analogue technologies. Digital technologies have heavily affected one of the cornerstones of culture, namely the intellectual creative activity. The spread of digital world had at least two important consequences: on the one hand intellectual creations may be manipulated in an unlimited amount and in unchanged quality. On the other hand due to the evolution of digital networks the distribution of and access to the works has changed too: it became easier, faster and more effective. These changes arm in arm with the phenomena of globalization have generally changed the traditional forms of human communication. Nowadays people can’t imagine their life without digital technologies. The social networking sites, chat rooms, blogs, podcasts, e-newspapers, or streaming of TV or radio programs are great example for this.